How curious is it that both liberal and conservative media have so obviously colluded in blacking out meaningful coverage of GOP presidential candidate Ron Paul? Add to this phenomenon that when coverage is unavoidable, it is heavily biased against Dr. Paul. This blanket policy by the mainstream media (MSM) toward this single candidate begs the question: Why is Ron Paul such a threat to both parties, so much so that the MSM has orders from on high to label him as "unelectable" but offers very little in terms of rationale for why it deems him so? Voters' curiosity should be piqued over this blatant dismissal of the candidacy of such a highly respected member of the U.S. House of Representatives. Texas voters have elected Dr. Paul 12 times as a Republican, and his base has grown exponentially since he became a national candidate, attracting conservative Republicans, moderate Democrats, and independents alike because his message has remained steadfastly constitutional in all things, no exceptions. In fact, his ability to raise money from individual voters is extraordinary, and if he were anyone else, this phenomenon would be covered ad nauseam by the MSM, especially because for them it is low-hanging fruit, so to speak. In other words, it does not require a lot of energy, intelligence, or work to cover fundraising. In the final analysis, Ron Paul is the only candidate who can beat Obama in 2012. (See cover story on page 6.) The establishment Republicans had best get their head around this sooner rather than later, because the Iowa caucus is around the corner. No other candidate can garner votes from the independents and moderate Democrats in the requisite numbers, especially if the the nominee is Gingrich or Romney. Furthermore, neither can hope to transfer votes from Ron Paul supporters, regardless. Interestingly, Congressman Paul's platform resembles that of Obama's 2008 candidacy of "hope and change," with promises of ending the war; repealing the USA PATRIOT Act because it harms Americans more than it protects them; eliminating expensive and fraudulent war contracting; deeply cutting spending; and evicting banksters and corporate insiders from cabinet and agency positions. These are all things Obama promised, but once in office he not only reneged on these promises but advanced these problems considerably, making him even more reprehensible than his predecessor. These campaign promises are also found as planks in the Iowa Republican Party platform (IowaGOP.org/platform.php). With such a large number of contenders in the upcoming GOP caucus, efficiency would dictate that comparing individual candidates' positions on the core issues to the planks in the Iowa Republican Party platform would be the best way to properly examine electability. Again, a relatively easy task for the MSM, which has devolved into nothing more than lazy American Idol-ish political coverage. It can be strongly argued that Ron Paul's positions, substantiated with an unblemished 20-year voting record, adhere to the Iowa Republican Party platform more consistently than any of the other GOP candidates. In fact, Dr. Paul does not even have a close second if the Iowa Republican Party platform is the measuring stick. So why do the GOP and the media cast Paul's libertarian constitutional positions as being "extreme"? If Paul's positions are extreme, then so is most of the Iowa GOP platform. Most controversial, according to establishment Republicans and the MSM, are Paul's positions on foreign policy, defense spending, and homeland security. The Iowa GOP platform planks read in part: "9.04. We support the repeal of the Patriot Act"; "9.08. We believe that the federal government should reduce the threat of terrorism by securing the United States borders at all points of entry"; "11.01. We insist on a national defense policy and a foreign policy that is in the sole interest of the United States"; "11.02. We believe in a strong national defense. We believe that one of the Government's primary roles is to maintain an adequate military force to secure the borders of the U.S. To accomplish this, we believe the U.S. should provide adequate funds to maintain a military force capable of protecting U.S. Sovereignty"; "11.12. We believe the United States must not adhere to or abide by any treaties that compromise the sovereignty of the United States or that are prohibited by the Constitution"; "11.13. We believe our servicemen should serve only the United States, our Constitution, and the American Flag. We are adamantly opposed to United Nations oversight of our military units, ceding national sovereignty to any foreign body, or to the establishment of a one world government"; "13.04. We oppose any taxes being placed on the United States by the United Nations." The above planks are practically verbatim what Congressman Ron Paul espouses, and has stood for unyieldingly during his 20 years in office. There is not a single word in Iowa's platform about nation-building, improving other countries' infrastructures, constructing the largest embassy in the world in Iraq before we withdraw troops in December, maintaining 900 bases in 150 countries, providing exorbitant amounts of foreign aid in the form of cash, soldiers, war contractors, weapons, and the list goes endlessly on. Paul contends that there is no tangible evidence that any of these expenditures overseas has made us safer here at home. He does contend, on the other hand, that our intervention has made us exceedingly unpopular. He makes the case: "How would you feel if foreign armies occupied your cities, especially when bombing and fighting was occurring in your neighborhoods?" Perhaps even more important, Dr. Paul receives more contributions from individual military personnel than all the other candidates combined. Paul is adamant about keeping spending for defense, but is opposed to militarism, claiming it is mostly foreign aid that does little to protect Americans but instead enriches a corrupt global military industrial complex. Obviously, military personnel agree. Other planks that mirror Paul's positions include : 2.20 - Abolish the federal Department of Agriculture; 2.22 - Farm subsidies should be phased out; 3.03 - Oppose government subsidies and bailouts that distort free markets; 3.25 - Oppose government control of the Internet; 4.16 - Eliminate both the Iowa and federal departments of education; 4.19 - Oppose No Child Left Behind; 5.04 - Global warming is a scientific fraud; 5.04-05 - Oppose any fines, taxes, laws, regulations, etc. related to climate change; 5.11 - Oppose cap-and-trade (American Power Act); 5:12 - Abolition of the Department of Energy; "12.12. We strongly oppose the diabolical collusion of the United Nations in establishing the unconstitutional 'sustainable development agenda 21' in our local communities, our state, and our nation"; 8.17 - Due to imminent failure of these programs, to abolish Medicare, Medicaid, and Social Security over time; 8.14 - Parents decide which vaccinations their children receive, if any; 10.25 - Jury nullification; 13.09 - Support the abolition of the IRS; 14.02 - Vetoing all earmarks and pork spending; 13.32 - Require a balanced budget; and 13.35 - Support auditing the Federal Reserve Bank. Stack these similarities up against the other candidates, and there is no contest. The other candidates have diverged too far, too often to compete as the leading conservative in the race. As for leadership skills, again, candidate Paul is second to none. A perfect example of this is Paul's Restore America Plan, which is a highly detailed blueprint for achieving nearly every plank in the Iowa Republican platform. You can evaluate it for yourself at RonPaul2012.com. None of the other candidates has submitted such a comprehensive plan for cutting $1 trillion in government spending and balancing the national budget in three short years. This is considerably more aggressive, something that the even the deficit-reduction "super committee" could not achieve. There is no other candidate committing such an exhaustive and detailed fiscal plan to paper. At a minimum, the MSM could use Paul's plan as a point of comparison, but instead it ignores it altogether. Certainly if Paul's plan is without merit, the MSM would use it against him, but apparently that is not an option. By every measure Dr. Paul far exceeds the other candidates in his understanding of and commitment to all the conservative core issues, such as no more deficit spending, limited taxation, free-market economies, personal and family liberties, protection of property rights, strong defense with limited foreign interventionism, and, above all else, the conservative principle of small government and state sovereignty. His plan cuts five agencies, including the IRS and TSA, altogether, and decreases the federal payroll by 10 percent, for starters. These are all in keeping with the Iowa platform. Let us not forget that in 2003 Paul accurately predicted the approaching financial crisis due to the federal government's intervention in the housing market via Fannie Mae and Freddie Mac, along with the Federal Reserve Bank's manipulation of interest rates. Don't Americans want a president that pays this close attention and fearlessly warns us? All the evidence points to the other candidates, most especially Mitt Romney and Newt Gingrich, as big-government Republicans. Both have a long history of supporting huge government programs, especially in health care - Romneycare in Massachusetts, and Gingrich's well-documented support of Clintoncare. Gingrich also has a lucrative history with the health-care industry, receiving $37 million from it for lobbying Congress. In addition, he was a paid consultant during the same time that Fannie and Freddie were failing, and while Fannie executives were indicted for cooking the books. Add to this both Gingrich's and Romney's documented support of cap-and-trade, including support of aggressive government intervention in climate change. This central-bank-backed agenda is rooted not only in growing government, but in expanding global intervention in domestic policies. There is little evidence beyond campaign rhetoric that these counterfeit conservatives would fulfill a limited-government agenda. Paul espouses, and history validates, that increased taxation has never resulted in reduced spending, but instead has always led to increased spending. Every time Congress legislates additional revenue through taxation, it has only increased expenditures and borrowing. Neither the Republican and Democratic parties nor the MSM share this fiscal truth with the public, so their arguments for additional taxation as a solution for resolving the national deficits are false from inception. Congressman Paul demonstrates fearless clarity in informing Americans that regardless of the expenditure, government has to borrow almost half the money. In other words, for every dollar of expense, 40 cents of it is borrowed, with interest. Recall that Dr. Paul originally exposed both parties' disingenuous claims of spending cuts as merely decreases in the automatic increases that plague the government's annual budgets. He is one of the few candidates willing to tell Americans that regardless of the economy, government budgets enjoy annual automatic increases. One of the most underreported facts is that any recent proposed cuts were only for lower automatic spending increases, resulting in zero actual spending cuts. Zero. It is complete spin, and only Paul has had the integrity to say so. The MSM minimizes Paul's candidacy with accusations of extremism, including claims that Paul's advocacy of limited government intervention in health care and welfare would starve the poor and allow sick people to perish. The record shows quite the opposite. In Paul's medical practice alone, he literally treats the poor for free. He makes this decision as a physician not beholden to mandates from the government. His position is that, in the absence of government coercion, society and the private sector have always stepped up to take care of those who cannot take care of themselves - much more efficiently and less costly than the government, specifically because government coercion does not foster results. Furthermore, if states want to deal with health care on a state level, it should be their exclusive domain, because states know their own needs better than the federal government. The federal government is ill-equipped, evidenced by the fiscal mismanagement of both Medicare and Medicaid. What better proof do Americans need that these welfare/entitlement systems are unsustainable as currently designed?What the MSM never explains is that Paul's Restore America Plan specifically grandfathers all current recipients of Medicare, Medicaid, and Social Security, as well as veterans' benefits. It is a bald-faced lie to say anything else. The corruption that goes with foreign-aid expenditures knows no bounds. Billions in cash have gone missing in both Iraq and Afghanistan alone. Private war contractors receive $150 billion annually, $60 billion of which qualifies as either fraud or waste, according to the recently released waste, fraud, and abuse report by the Commission on War Contracting. Nearly half of the money allocated to this particular portion of defense spending is either waste and/or fraud. Even worse is that the waste, fraud, and abuse are putting our own military personnel in harm's way! Every American should watch the C-SPAN hearings the commission held to report its findings to Congress. This is true "reality TV." Understanding the danger that war contractors alone pose to our troops will boil your blood. Most are basically unaccountable, and receive billions more for the same jobs. It is unconscionable. Paul recognizes the inanity of these programs and policies. Obama ran on the promise of eliminating the 100,000 war-contract personnel deployed when Bush left office, instead increasing the number to 200,000 in the following 18 months. That number promises to grow exponentially again once troops are pulled from Iraq. Even globalist Council on Foreign Relations president emeritus Les Gelb acknowledges: "The real shocker was how all those candidates, save for Paul and Huntsman, almost totally neglected the now-central economic dimension of international affairs. Only those two noted the new reality of world politics - that economic strength matters more than military might." Consider that if Paul's Restore America Plan were implemented and militarism (nation building, interventionism, and nearly 900 military facilities) was cut from the budget, our defense budget would still be larger than all other countries' military budgets combined! Finally, Dr. Paul is the only candidate whose voting record bears witness to his upholding his oath to protect the U.S. Constitution. He has never disappointed the American people by waffling on this sacred duty. His strength of character is rare, indeed. While Paul is not as telegenic as a Romney, he also doesn't need a teleprompter. Interviewers can't trip him up because his message is always grounded in truth. 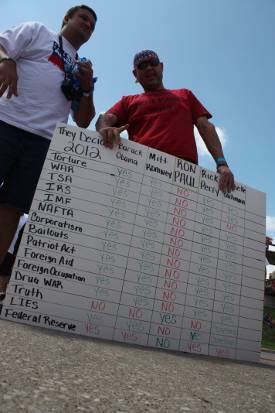 He meets all of the Iowa GOP platform's moral attributes, both personally and politically. If personal morals are a barometer for Iowa caucus-goers, then Gingrich is the quintessential opposite of Paul, who has been married to his wife Carol for 54 years. Three marriages, one after the other? Hardly Iowa values, if voters stand by the Iowa GOP platform. Former Speaker Pelosi recently threatened to expose ill deeds former Speaker Gingrich was investigated for by the House Ethics Committee. Gingrich's response was that if she told, she'd be in violation of House rules. There's a confidence builder. Dr. Paul recognizes that America was founded as a republic under the rule of common (natural) law, and recognizes how far afield we've gone in legislating and adjudicating beyond what the U.S. Constitution allows, corrupting the rule of law and jeopardizing the very liberty these branches are tasked to uphold and protect. Unelectable? Wasn't Obama also considered unelectable? It is time to elect a president who, like Paul, respects the authority of the people as greater than that of any branch of government - people first, states second, and the federal government a very distant third. Please note, Iowa Republicans: These principles are echoed in numerous planks in your own platform, as well.